Zostel Kathmandu was the best hostel i stayed during my time in Nepal. The atmosphere and food were really good. The personal makes extra effort and making you feel comfortable and helping you out with any requests. The hostel is amazing, the rooms are nice, but the staff will everyting to make you happy. Kept coming back to Zostel Kathmandu! Its close to the centre of Thamel, 3 min walk. 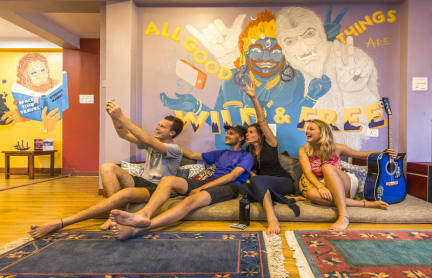 Lovely hostel, fun place to meet people! Good beds and amazing option for private rooms. Day trips are organized every day. If possible try and get a bed on the 2nd floor or up: the first floor has a lot of sound pollution from the common areas in the early mornings/late nights. Very nice staff, always there to give information/help you with bookings. The rooms are super clean and comfortable. We always chose this hostel when we were in Kathmandu. Good food also in the cosy restaurant/bar. Thanks a lot to the staff! Very nice experience, came back multiple times. Clean rooms with big storage, good kitchen, nice atmosphere; met a lot of people here. They do short trips in the city to some sights every day. Lovely! Great hostel! The beds are clean and relatively big. The lockers are really big which is great for all your stuff! The common room upstairs is a great place to just hang out a bit and there is an amazing rooftop. Next to that there is a nice bar downstairs which is good and fairly prices given what you will find in Thamel! Very Nice and clean hostel! Only little downside is the location since it is situated on a (dark) small ally, coming home alone in the evening didn’t feel that pleasant! Beneficial from the location is that it is peacefull and quite since it is not situated in the noisy parts of Thamel. I would definitely recommend this hostel to stay! Zostel is such a nice hostel in Kathmandu. It's in Thamel, but in an alley off the mainstreet, which is great because it's more quiet. 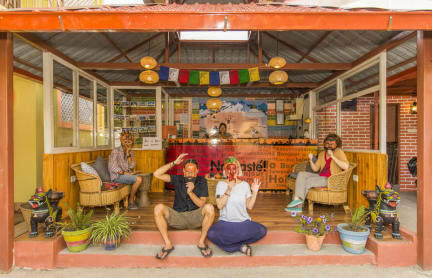 The atmosphere within the hostel is great, very social, super easy to meet people and enjoy the delicious (yet a little bit expensive compared to other places in KTM) food in the yard or chill on the rooftop net with an amazing outlook on Kathmandu or join on of the arranged day tours. It was my first hostel in Kathmandu and I came back twice. Although it is relatively more expensive than other hostels, it is worth it. Hot showers in winter time, good common room, rooftop in the sun and a good atmosphere and heating in the rooms make the hostel very nice! Came back here three times and would come back again. The hostel is a bit off the main road which makes it very quiet. However the alley getting there can feel a bit sketchy in the dark. Staff helped with everything! Nice place for meeting other travellers.